Although the following is NOT a Satirical Article, we REALLY wish it was. In one day, Donald Trump has fulfilled a vast majority of the Hillary Clinton 2016 campaign promises. He has signed a $1.3 trillion dollar spending omnibus. He has continued to fund Planned Parenthood, perpetuating the death of millions of unborn children. He has expanded family planning services beyond America ($51 million). He has given billions to international bodies like the UN. He has dedicated millions to advocating neoconservative “democracy promotion” in Europe of all places. He has spent millions for promoting gender diversity in the Middle East. He has promoted border security in OTHER nations. He has also strengthened America’s background check systems, implementing gun control. 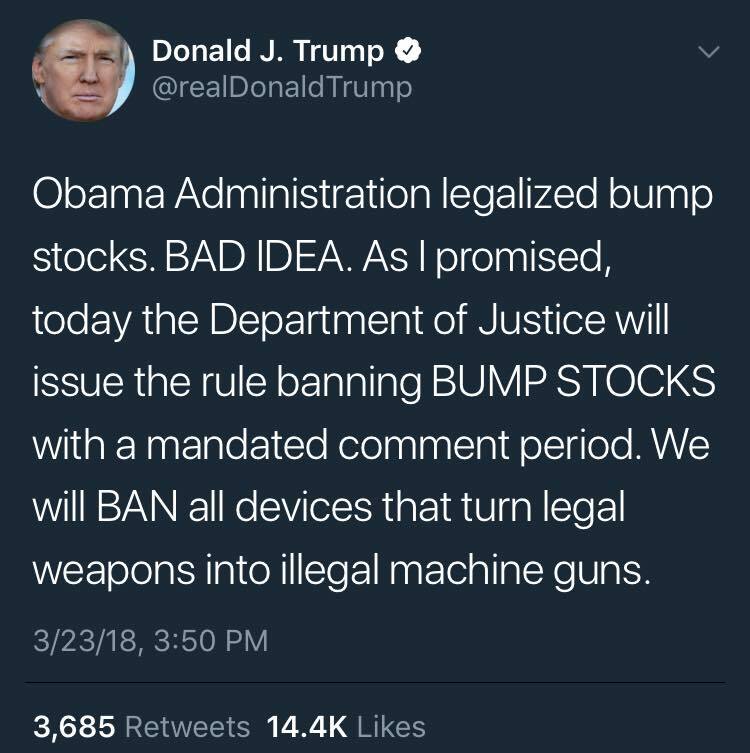 In addition, he has ordered the Department of Justice to reclassify bump stocks, pieces of plastic, as machine guns (imagine being that melodramatic). Simply put, we are living in Hillary’s America. As Trump so generously points out, Obama was more pro-gun than he is. After appointing John Bolton as National Security Adviser, Mike Pompeo as Secretary of State, and Gina Haspel as CIA Director, the America First pipe dream is dead as well. America, being the people of America, is in last place, and the State is first. If Obama had signed any one thing that Trump just signed, RINOs would be rioting. But because Trump does it, it’s different. It seems that Tom Woods is right: no matter who you vote for, you always get John McCain. You get a neocon Keynesian with no concept for individual liberty. His idea of America is a global empire in which he wears the crown and sits upon the throne. To be frank, there is little between no difference between Candidate Clinton and President Trump. The only difference is that Trump has the power to implement Clinton’s leftist utopia, which punishes the advocates of private property while rewarding the scourge of economic nationalism. This, of course, leads to the global State, forcing the assimilation of cultures and nations. While candidate Trump had his highlights, and some good was done as president in 2017, Trump has made it abundantly clear that 2018 and on will be dedicated to growing the government and perverting the meaning of conservatism. Liberty is under attack. And it seems that there is one substantial difference between Trump and Clinton: Clinton would have implemented these policies sooner.